Known as the “Land of Smiles,” Thailand is a country well-known for being tourist-friendly. Besides diverse geographic features and stunning vistas, Thailand’s cuisine, rich cultural traditions and the natural friendliness of its people make this country a traveler’s Mecca. Its location at the center of Southeast Asia makes it an ideal base for touring the region.When we were assigned by our former organization to Southeast Asia most of our travels were routed through Thailand and we ended up passing though the country more than any other in the region. This gave us an opportunity to befriend a number of Thais and be immersed in their culture. Thailand is a mix of the past and present. Left: the Kinnon, a mythological figure, half man, half bird, Grand Palace, Bangkok. Right: elevated metro rail system snakes its way through downtown buildings, Bangkok. Thailand is a wonderful mix of the past and present. It has maintained much of its cultural traditions which you often encounter in the form of Buddhist temples, stupas and monks in every city or town you visit, their famous cuisine and traditional greetings such as the wai. And yet it is also a newly industrialized nation that has experienced rapid economic growth in the last three decades. The latter is most noticeable when you visit Bangkok with its gleaming shopping centers, international flavor, luxurious hotels and overwhelming traffic. Thai culture is heavily influenced by Buddhism. Much of our time in Thailand was naturally spent in Bangkok. The first time we went there in 1998 we were wary of the traffic which some friends had described as legendary. “Better to walk to your hotel than take the taxi,” as one of them quipped. To our surprise though, the traffic we encountered was no worse than that in Manila (another city infamous for its traffic congestion). This was because the Thais had just completed several elevated highways which made it possible to navigate huge chunks of the city above the feared chaos below. Overhead trains also made travel by public transport more convenient and less time-consuming. 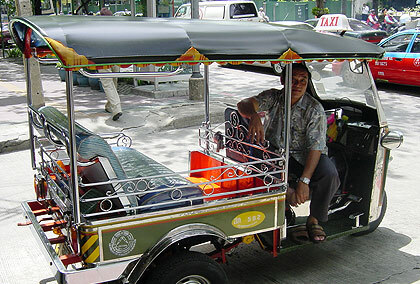 A tuk-tuk or 3-wheeled taxi (auto rickshaws in other countries or tricycles in the Philippines) parked on a Bangkok street. Bangkok is of course famous for shopping. The Ratchaprasong district (including Siam Square) and Sukhumvit are home to many of the glitzy malls in the city. If you’re looking for bargain deals Bangkok has numerous options. One of our favorite shopping destinations is the Chatuchak Weekend Market, a must-visit place for its size and variety of merchandise located in the northern part of Bangkok. This is the place we often visit when shopping for gifts to bring back to friends in the Philippines. With its 8,000 stalls Chatuchak has just about everything you can think of buying. During our first years in Bangkok we often went to Pratunam, another shopping place that offers relatively cheap prices for fashion items. The MBK (Mah Boon Krong) Shopping Center is another mall that is famous among locals and tourists and boasts of around 2,000 shops that sell a variety of merchandise also at relatively inexpensive prices. If it’s computers, digital cameras and other tech items you’re after then the multi-story Pantip Plaza IT Mall is the place to go. If you don’t make it before closing time at the malls (usually 9PM but up to 10PM for others), you can go to a variety of night markets in the city, the most famous being the Patpong Night Market. Chakri Mahaprasat Hall inside the Grand Palace complex, Bangkok. Besides the shopping places, tourists also flock to the Phra Nakhon district, an area known for its cultural and historical heritage. 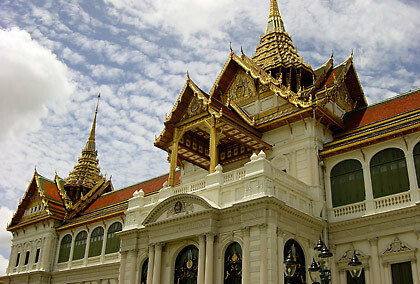 Attractions here include the Grand Palace, the Wat Pho, the Democracy Monument and the Sanam Luang. The Grand Palace used to be the official residence of the King of Thailand until the present king (Rama IX or King Bhumibol Adulyadej) moved his residence to another location in 1946. 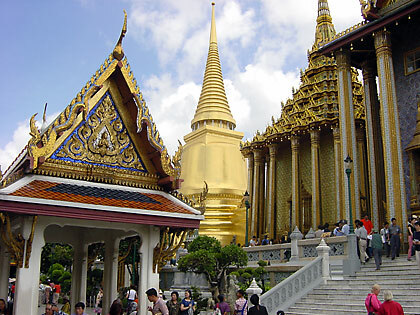 The Grand Palace though is still very much in use with many rituals being performed by the King every year. It is open to the public and provides a good deal of photo opportunities with its numerous structures and images. 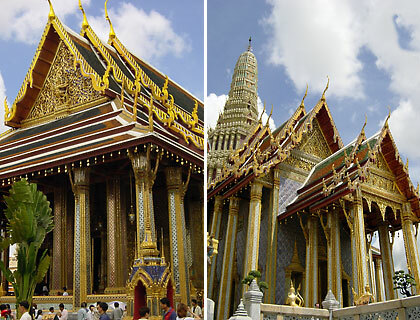 Structures in the Grand Palace complex – Left: the Wat Phra Kaew, home of the Emerald Buddha; Right: the Prasat Phra Thap Bidon. Bangkok is just the starting point for a tourist trying to take in Thailand’s charms. 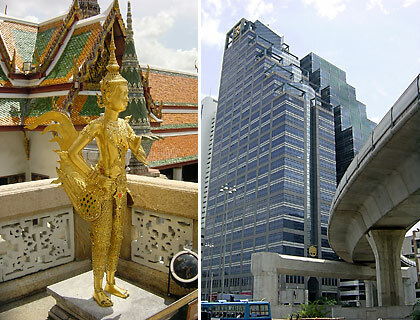 Bangkok is a convenient travel hub for the region as well for many travel destinations in the country. However there are many attractions that are just a stone’s throw away from the capital. Ayutthaya, just 76 kilometers north of Bangkok is the old capital of Siam and in the 18th century was one of the world’s largest cities with a population of about a million. It has numerous ancient ruins and art works. Kanchanaburi in western Thailand near the Burmese border is famous for the Bridge Over the River Kwai (actually the Khwae Yai River), an infamous railway bridge that the Japanese forced Allied prisoners of war to build as part of the Burma Railway. There are war museums and cemeteries in memory of the fallen – both Asian civilians and British Commonwealth servicemen who died in building the railway. 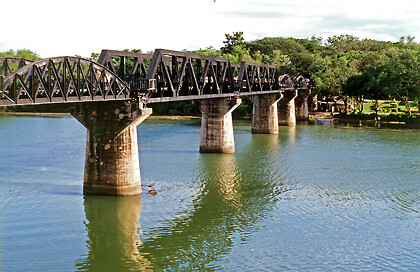 The Bridge over the River Kwai, Kanchanaburi. Northern Thailand is famous for its mountains, valleys, forests and hill tribes. The climate here is relatively cool compared to the rest of the country. Chiang Mai is the tourist and commercial hub of the region and has numerous attractions and activities to offer to the traveler in these parts. In our visits to this city we have observed quite a number of foreigners who have chosen to settle here. The mountains around Mae Hong Son are filled with stupa-studded peaks and villages of post-Stone Age cultures. Southern Thailand is home to well-known beaches and resorts on the Gulf of Thailand and Andaman Sea coasts. These include Phuket, Krabi, Phang Nga and Trang including the limestone karst islands of Ko Tao and Kho Phi Phi Don. Less famous among tourists is the southern stretch of Thailand close to the Malaysian border. We made two trips to this region, starting from the city of Hat Yai in Songkla province. This part of the country contains a sizable Malay population and the influence of Muslim culture becomes very evident the more you head south towards Malaysia. Another interesting discovery we made here is that the cuisine is a wonderful mix of Thai, Malay and South Asian influences. Several Pakistani friends who were with us on one of these trips and who had a difficult time adjusting to Southeast Asian cuisine felt right at home here with the food. Thai cuisine is of course well-known not only in the region but the world over. Although most Thai dishes are known to be hot or spicy especially to Westerners, Thai cuisine is actually a balance of the five basic tastes: hot or spicy, sweet, sour, salty and bitter. Among our favorites are tom yam goong/kung or hot and sour soup with shrimp or prawn, tom kha which is similar to tom yam but made with coconut milk, phad thai or pan fried rice noodles with vegetables, meat, peanuts and lime, pha nang curry - a mild creamy coconut meat dish - and som tam thai or grated green papaya salad with peanuts, dried shrimp and palm sugar. A Chinese-Thai dish that we enjoy very much and served at a guesthouse we usually stayed at during our trips to Bangkok is a type of chicken cashew nut dish served with a tasty sauce and taken with mixed fruit shake. Finally take typical Thai sauces and condiments such as phrik nam pla (consisting of fish sauce, lime juice, chopped chilies and garlic), dried chili flakes and sliced chili peppers in vinegar to give these already tasty dishes additional spike for a truly satisfying gastronomic experience. The people of Thailand make a stay in the country an experience to remember. 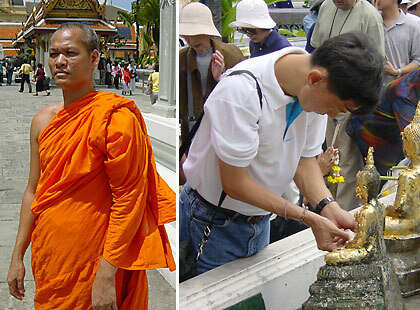 Thais have a friendly disposition towards visitors and will make you feel very welcome. We remember setting up a meeting with the top government official in a big southern city who delayed his lunch and stayed just to welcome us, a group of anonymous visitors. The Thais’ sing-song way of speaking is refreshing and eases any tension one might have in interacting with them. No wonder Thailand is a tourist’s paradise.